Months ago I introduced Icecream eBook Reader in my blog, now the Icecream Apps studio launched a super powerful 24-in-1 online PDF tools for everyone to use free of charge. It’s called PDF Candy. PDF Candy‘s main functions include convert Word to PDF, PDF to image, image to PDF, ODT / Excel / PPT / MOBI / FB2 to PDF, PDF merge / split / compress / encryption / unlock / flip / delete page / add watermark and so on, all these features are the most commonly used by us. What’s more, all of these features can be used online, no need to install any app or software. Visit https://pdfcandy.com/, choose the feature you want to use, every single feature has its own icon, very easy to figure out. I take “PNG to PDF” feature as example. Click the “+” button to open computer’s file browser, you can also upload file from Google Drive of Dropbox. You can add multiple images for converting. 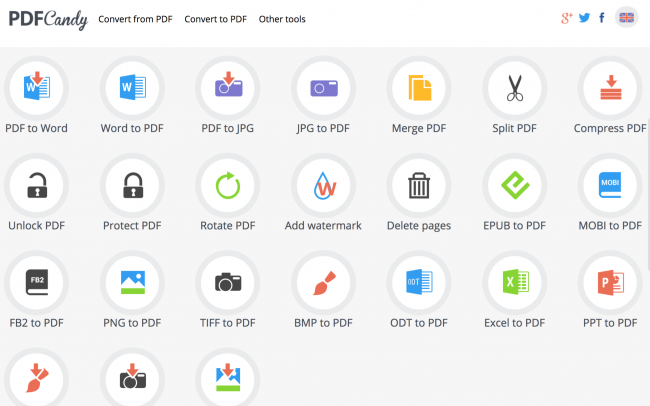 When all files are uploaded, click the convert button, PDF Candy will process them for you. With this feature we can convert multiple images into one PDF file, click download button we can download the converted PDF into computer.